Sik, over at Sonic Retro, has completed his hack of Sonic 3D Blast that removes the Flickies from the game, leaving you to run around and play the game as if it were a true, isometric version of a Sonic game (where the goal is to simply make it to the end without dying). I must say that I enjoy 3D Blast one-hundred times more than I did (I didn’t really like it, so that’s a huge improvement). Who knew that taking out the entire crux of a game could make it more entertaining? In this hack, Flickies will still appear, but you will no longer be able to collect them. The big rings will always let you proceed to the next area and any areas (like the tube in Panic Puppet) that prohibit your advance due to your Flicky count will allow you to go anyway. With all this fun to be had, however, it must be said that now that the lost, core mechanic of the gameplay makes the game much easier. It was designed around Flicky collection and now you can just blow through every stage without a need to explore every corner of the isometric worlds. Still, I hate Flicky collection, so it does not bother me that much. I have never been arsed to play this game all the way through, so here’s to Sik for making a mediocre game interesting. Head on over to Sonic Retro to download the hack! 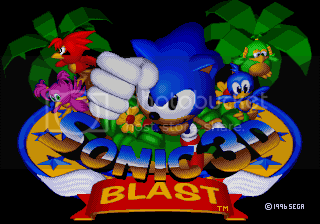 Fun Fact: Sonic 3D ‘Blast’ was renamed to Sonic 3D: ‘Flickies Island’ for the European release. The Wiis European Virtual Console update today added another Sonic title to the service, first released in November of 1996 ‘Sonic 3D’ is now downloadable for the cost of 800 points. This has prolly been mentioned in every other website and board under the sun, but… more info on Sonic Mega Collection!